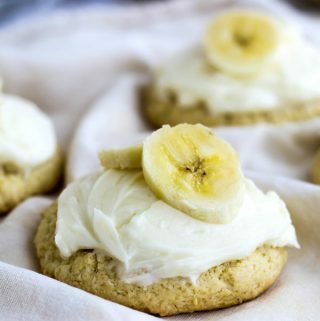 We all love those big old soft sugar cookies, how about having them banana flavor? 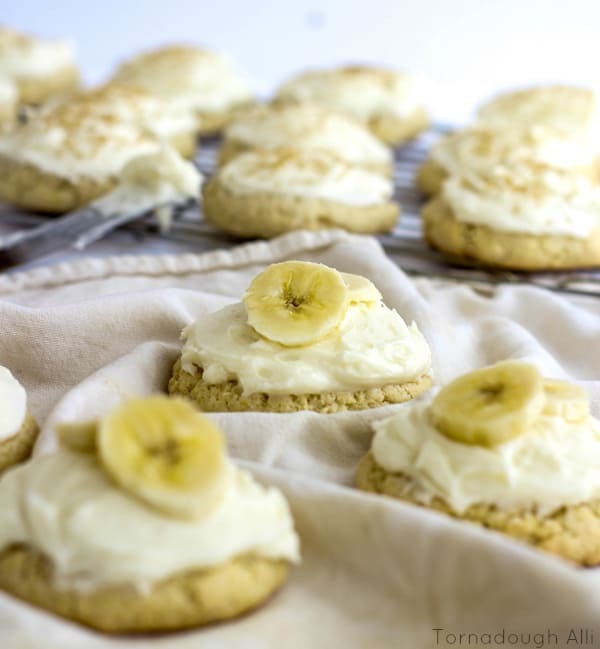 These Banana Cream Lofthouse Style Cookies are off the wall in flavortown! Have you ever been in food love? Like having that one recipe, one dish or one restaurant item that sends your taste buds into overload? 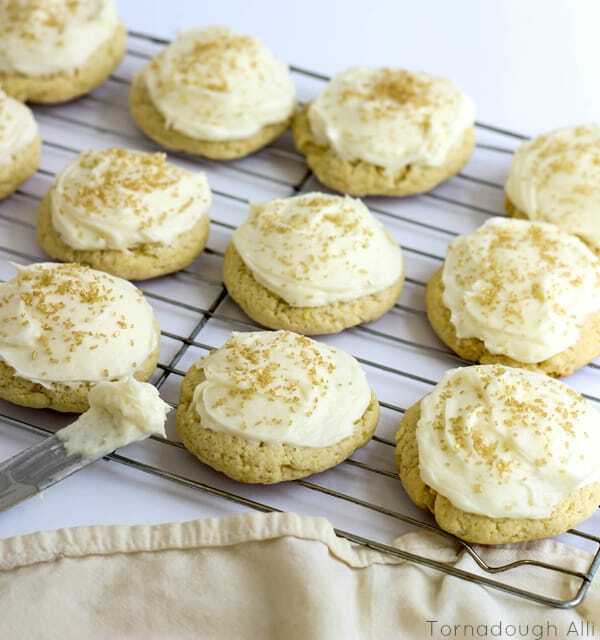 Well these Banana Cream Lofthouse Style cookies are mine. It is heaven in every single bite. I can’t even emphasize that enough, this are hands down one of the best cookies I have ever had. Ok, so I’ve said that these were flavorful, but they are also super easy. And we all know how I love easy recipes, especially when they are gone in less than a day. Every time we go to the grocery store my 2-year-old runs to the bakery and just stares at their Lofthouse style sugar cookies. Obviously since she is adorable I always give in. I totally forgot how easy these were to make, so bye-bye store-bought and hello homemade. 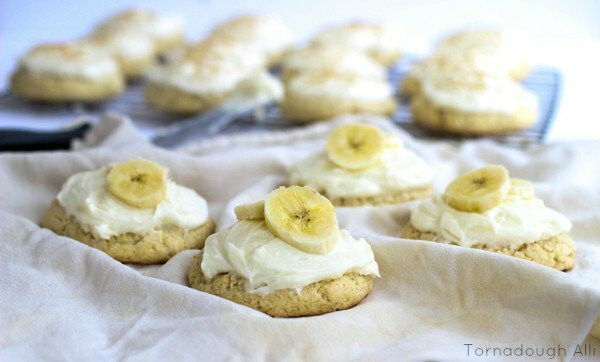 Now you could totally make these plain sugar cookie version, but how boring is that (not at all really, but trust me, banana is always better)? Since we all now I am the BIGGEST banana fan, just check out some of my banana recipes here, here, here oh….and here! I’m absolutely sure there will be plenty more to come, I would post about banana every day if I could, that’s how obsessed I am with the flavor. 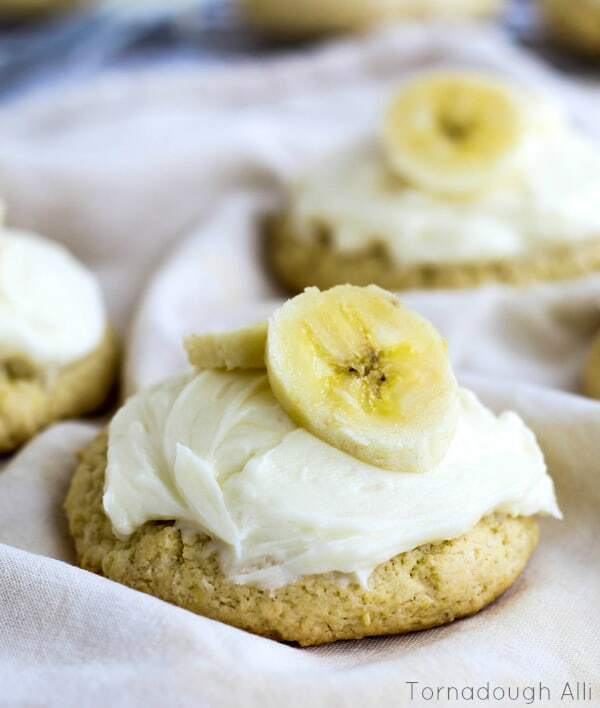 What is your most loved banana recipe? I will most likely be all over it! In a large bowl combine sour cream, sugar, butter, eggs and vanilla and mix until well blended. In another bowl combine flour, baking powder, baking soda, dry banana pudding mix and salt and slowly then add to wet mixture and mix until incorporated. With large spoon or cookie scoop crab dough (2-3 Tbs worth) and roll into a ball and place on cookie sheet, gently flatten each cookie with the palm of your hand. Bake for about 10 minutes or until light golden. Meanwhile make your frosting by mixing your cream cheese and butter together in bowl. Mix in your vanilla then one cup at a time mix in your powdered sugar until you reach your desired consistency. Frost cooled cookies and decorate with sprinkles, banana slices, etc. YUM oh YUM! Thanks so much for sharing with us at Weekend Potluck. These look irresistible! Thank you so much! Hands down my fave cookie, ever! Now that is a cookie. It looks like a great recipe I could come undone with and love it. Thanks Kathleen, these are addicting and with being on a “diet” it was hard to not devour each and every one of them myself. I love the banana idea! !They look so big, soft and delish! Thanks Quinn, these didn’t even last a day!